When I heard about this book, it confirmed that I was not going crazy. I have had countless conversations with friends about worship specifically, our individual beliefs and perceptions of it. God has instilled a newer and fresher way to approach worship to me, and it all started in the summer of 2010 when I was recruited by my youth choir director to go a summer camp that consisted of students with the potential to lead their churches in worship, either while in youth or as a life calling. In this season of my life, I was starting to come back to the church after being a spiritual rebel/runaway, and one of the ways I began to get involved again was being a part of our youth worship band. All of us students were an experimental group of the first ever Resonate Music Worship Arts Camp held at Oklahoma Baptist University. It was here where God revealed that worship is not just a wave of raised hands or singing the loudest one could possibly sing, it was about revealing our entire selves to Him. Ever since that summer and the summer after when I was chosen to go the camp again, worship has never been the same for me. Worship is a sacred action that God expects all of us take part in as His children. 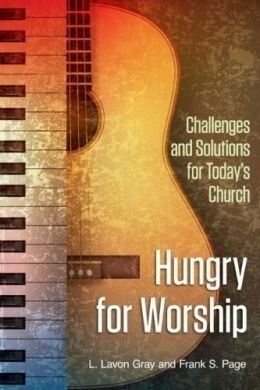 In the book Hungry for Worship: Challenges and Solutions for Today’s Church by Frank S. Page and L. Lavon Gray, is a book over the study of worship. Some may say, “Study worship? Worship is only retained within the church walls and services.” However, it is not. Worship is so much more than what we have concocted as a modern church culture. Worship today has evolved into a division of generations and music preference; worship becomes crowded and superficial when we involve ourselves as one of the elements of fixation during worship. One element I loved about this book is that it has pointed out what I have observed in our churches. Seeing people just casually walk in before worship, drinking their coffee not only before worship, but during! It drives me crazy to no end. I know I can never comprehend the God we love and serve, but I believe the casual approach with coffee in hand during worship is the equivalent to ‘Jesus is my Homeboy’, when in reality it should be ‘Jesus is my Savior, Friend and Judge.’ We should be in a healthy fear of Him. Worship is not of our benefit; it is an act of surrender of self and worshipping God in all ugliness and wholeness of self. True acts of worship is acknowledging our state of sin, believer or non-believer, and revealing the nakedness of our souls before Him, holding nothing back. God is all-knowing, but still wants to see our surrender in action. In modern church culture, we have defined and water-downed worship to the point where the music is the only element of worship. Another element I detected in the book is how the church has evolved into more into accommodating music preferences, and less about the reason the body is gathered: to worship. The church has become divided by generations, and the one thing all generations across the board are related is by the stubbornness and lack of openness of foreign music to the respectable generation. “Unfortunately, when left to our own preferences we often revert to what C.S. Lewis called chronological snobbery, where older generations only find value in the traditions and heritage of our faith, while younger generations only find relevance in what is current. In the end, this division by churches into separate worship times, defined by musical styles, effectively began dismembering the body of Christ limb by limb,” pg. 37. This does not ring any more truer. Also in Hungry for Worship, it gives an historic timeline and shows the evolution of the American church within the last century. It is put in there to show where the church has been, and has the potential to be headed toward. The thought provoking book also talks about the evolving standards of the Millennial generation and the discipleship/leadership they have followed up to today. That foundation for future worship leaders need and (have the need) to be educated in the classical and modern way of worship. Yes, we need to remind ourselves where the church is from, but we are also called to make the church approachable to a modern society and the generations to follow. Even though the book seems to be calling out specifically present and future worship leaders, I would encourage anyone to read it because it challenges us to embrace and act in worship as God intended it to be.